Here, you will know about how to automatically delete cookies in Firefox excluding whitelisted websites. For that, I’m going to use a Firefox add-on named Cookie AutoDelete. 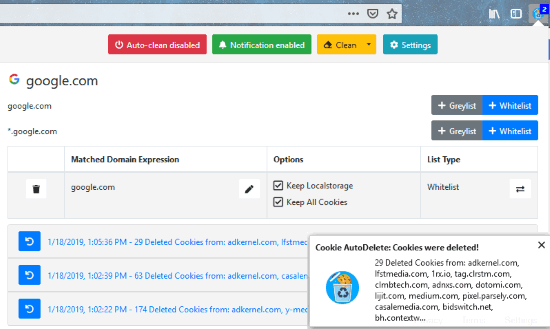 Using this add-on, you can automatically clean cookies of all opened tabs, of a particular domain, and local storage of a domain. Also, if you don’t wish to remove cookies for a few sites then you can mark those sites as whitelist and greylist. Doing so, you can prevent those marked sites from clearing the cookies. Cookies are the small files that are sent from website and store in user’s computer. So, the web server keeps tracking the user’s activity. Having cookies in computers is not bad but sometimes you don’t want to store your information on a few sites. This add-on automatically removes cookies so you don’t need to clean cookies manually. Once you install this Firefox add-on (Cookie AutoDelete), an icon appears at the top right next to the address bar. As shown in the image below, the add-on has all these options named Auto-clean disabled, Notifications enabled, Clean and Settings option. Clicking on Auto-clean button means If you want to remove cookies automatically from all the sites you visit, then enable this auto-clean option. But if you want to clear cookies from sites manually, then you can disable this option. Also, you can enable/disable notifications. When you click on the Clean option, it displays three different ways to remove cookies from sites. 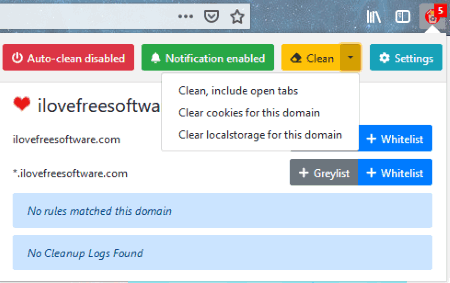 Choosing the first way (Clean, include open tabs) indicates that this cookie cleaner removes cookies from all the tabs you’re currently working on or opened tabs in Firefox. Using the second way (Clear cookies for this domain) demonstrates that you can remove cookies only for a particular domain. The third way of removing the cookie depicts the same way where you can clean local storage for any particular domain. There is a color changing game also behind detecting the cookies. When this cookie cleaner detects cookies on any site, the add-on icon turns Red showing the numbers of cookies. And when you mark any site as whitelist then the icon becomes Blue as the original color of icon whereas marking a site as greylist changes the icon color as Yellow. Here, whitelist and greylist sites mean you won’t lose the cookies of those sites which you have marked them as a whitelist. In this way, you can directly remove cookies of the rest of websites. I tried three different websites where I marked two sites as whitelist and greylist respectively whereas I didn’t do anything with the third site. Thereafter, I clicked on the clean button and this cookie cleaner removed all the cookies from all opened sites except those sites which I have marked as whitelist/greylist. You may also visit this article to find more Firefox add-ons to control or remove cookies. Cookie AutoDelete is a good cookie remover. Using this add-on, you can easily clean cookies of multiple websites except for whitelisted sites. I personally like this whitelist feature in this addon. You may also try this add-on and control cookies for different websites.